The red zone is not a real place on any football field, and its prominence in football parlance is only limiting our understanding of the game. After spending thousands of hours of my life with Dierdorf, Buck, and all the other great orators of our time, it’s still unclear to me why everyone seems to think the “red zone” is an acceptable concept. Of course we all know this is the area within 20 yards of the goal line, but beyond that — what the hell? I guess it’s called the red zone because teams are more likely to accumulate points once they arrive there, but the placement of the red zone boundary at the 20-yard line has always seemed so arbitrary. Why not the 15? Why not the 25? Most NFL kickers can make 45-yard field goals on a regular basis, so why doesn’t the red zone start at the 28? When we talk about the red zone, we’re talking about an over-hyped subset of playing space, but this idea of vague spatial zones is not unique to football. In our era of Google Maps and GPS, the understanding of space in sports remains almost foolishly antiquated; every sport is plagued by these kinds of vague colonies of playing space. Soccer has its “attacking third”; baseball has its “strike zone”; basketball has its “mid-range”; the list goes on and on. Some of the partitioning is imprecise, some of it is arbitrary, some of it is both. But, regardless, these divisions not only affect the way we talk about every sport, but perhaps more importantly, their ambiguity hinders the way we understand sports in general. It’s cool that pro wrestling has its Muta Scale, which is awesomely arbitrary, but other sports need some more legitimate scaling. The good news is that we’re getting better. Recently, at the end of close NFL games, as a team is frantically driving toward a last-gasp field goal attempt, we’ve seen the television networks superimpose a red line at the edge of “field goal range” as a way to visually emphasize this key spatial threshold. This line is definitely “red,” but it’s never placed at the 20-yard line — it’s always somewhere between the 30 and the 40. The field goal range boundary line is perhaps our best precedent for where a “red zone” might actually begin; after all, the line is placed at the estimated edge of the point-scoring zone. But, the field goal range line raises a broader question: What is the relationship between field position and scoring expectations in the NFL? This is a basic question with no easy answer. However, thanks to the emerging NFL analytics community, we’re beginning to understand the interactions between scoring expectations, field position, and other key variables. One great contribution is the Expected Points (EP) model, which forecasts future point outcomes based on three characteristics of a team’s predicament: field position, down, and distance. Mapping out Expected Points reveals the essence of NFL gameplay. For example, a first-and-10 from your own 20 is worth 0.34 expected points; first-and-10 from midfield is worth 2.04 expected points; first-and-10 from your opponent’s 10 is worth 4.74 points. The Expected Points value increases along with the betterment of your offensive situation. EP is more complex than the expected outcome of the current drive. For every play in recent memory, EP sums the subsequent points scored throughout the rest of the game. By adding up all the following points scored both by the offense and against it, we can estimate the “net point advantage” of any line of scrimmage, down, and distance combination. First-and-goal from your opponents’ 1? You’re happy. Third-and-15 from your own 1? You’re fucked. 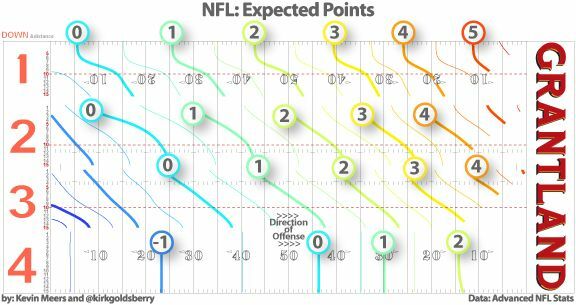 Although this is kind of obvious, when we visualize the Expected Points of thousands of NFL predicaments things get interesting. A static red zone now seems completely implausible. Because scoring potential depends on more than the line of scrimmage, drawing a red line across the 20 simply cannot accurately reflect the area where the offense is most or least threatening. Gaining an additional yard becomes more valuable as you approach your opponent’s end zone and fourth down. Deep in your own territory, you have to move much farther than if you were on the other side of the field for a one-point increase in EP. Similarly, advancing the line of scrimmage one yard adds more EP on third than on first down. Fourth down looks weird: The lines are straight and the expected points seem too low. The lines run vertically because teams almost always attempt a field goal or punt on fourth down, and neither of those plays’ success depends on distance-to-go. The point values are low for two reasons: missed field goals (just ask Billy Cundiff how easy it is to kick 30-plus-yard field goals) and the kickoff following a successful field goal. When we use EP, remember that we are measuring the net point advantage for the rest of the game. Even though the offense is about to score, the other team will possess the ball shortly, giving them a chance to put up points of their own. We have to take this possibility into account, lowering the EP values. This map is for the average NFL team. Each team’s personal map could differ significantly from this one: New England’s would be much more red, Arizona’s much more blue. 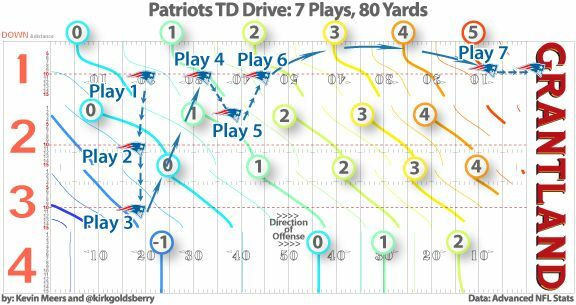 The EP framework also allows us to evaluate NFL plays and drives in a new way; for example, during the second quarter of last week’s divisional playoff game between the Texans and the Patriots, New England went on a seven-play, 80-yard touchdown drive. The Expected Points framework provides a novel means to review this sequence. Play 1: First-and-10 from the NE 20. Expected Points: 0.34. Stevan Ridley rushes for a one-yard loss. EP value: -0.59. Play 2: Second-and-11 from the NE 19. Expected Points: -0.25. Tom Brady throws incomplete pass to Wes Welker. EP value: -0.43. Play 3: Third-and-11 from the NE 19. Expected Points: -0.68. Tom Brady throws complete pass to Wes Welker for 13-yard gain. First down. EP value: 1.68. Play 4: First-and-10 from NE 32. Expected Points: 1.00. Tom Brady throws complete pass to Brandon Lloyd for seven-yard gain. EP value: 0.38. Play 5: Second-and-3 from NE 39. Expected Points 1.38. Stevan Ridley rushes for six-yard gain. First down. EP value: 0.39. Play 6: First-and-10 from NE 45. Expected Points 1.77. Tom Brady throws complete pass to Wes Welker for 47-yard gain. First down. EP value: 3.17. Play 7: First-and-goal from HOU 8. Expected Points 4.94. Tom Brady throws complete pass to Shane Vereen. Touchdown. Aside from the touchdown, the two biggest plays in this drive were the long pass to Welker and the third-down conversion. Going from the third-and-11 from their own 19 to first-and-10 at their own 32 is obviously advantageous, but this is also reflected in EP values; visually you can identify “big” plays on our chart when a play crosses multiple “EP contours” — conversely, the most forgettable plays are the ones that don’t cross these contours. EP presents an additional, albeit not perfect way for us evaluate NFL situations and plays. It sheds new light on a coach’s decision to go for it on fourth down (how many Expected Points are they giving up by not trying for a first down?) or how big a particular play was (was that one-yard touchdown run really that big a play?). With the playoffs in full swing, the stakes of every decision and play will become greater and greater, and emerging analytics can only help us all become more astute football spectators. So as you watch the games the weekend, remember one thing: There is no red zone. Kevin Meers is the co-president of the Harvard College Sports Analysis Collective.